Yesterdays is home to a truly different collection of home accessories and personal luxuries from around the world. Since 1987 our shop in Kilkenny has held an old world charm where customers are valued for life. Our product range has always maintained a sense of style and beauty with a quirky eye for design. The Yesterdays Collection is impossible to describe but includes mirrors, tiffany lamps, framed prints and a huge range of quirky home accessories. How it Works: Use this gift voucher on AllGifts.ie to order gift cards for use in-store only in Yesterdays in Kilkenny. Or you can swap this voucher for any other gift or voucher listed on AllGifts.ie. Yesterdays gift cards are posted out free of charge once ordered. Yesterdays, 30 Lr. Patrick Street, Kilkenny. Phone 056 7765557. Since 1987 our shop in Kilkenny has held an old world charm where customers are valued for life. Our product range has always maintained a sense of style and beauty with a quirky eye for design inspired by the elegance of bygone times. The Yesterdays Collection is impossible to describe but includes mirrors, tiffany lamps, framed prints and a huge range of quirky home accessories. Yesterdays Gift Cards are posted out free of charge, normally within 5 working days. 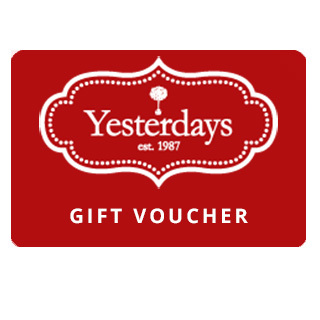 If you choose to collect your your Yesterdays Gift Card, you will need to get confirmation that the card is ready for collection before you go to collect. You will be asked for photo ID on collection.